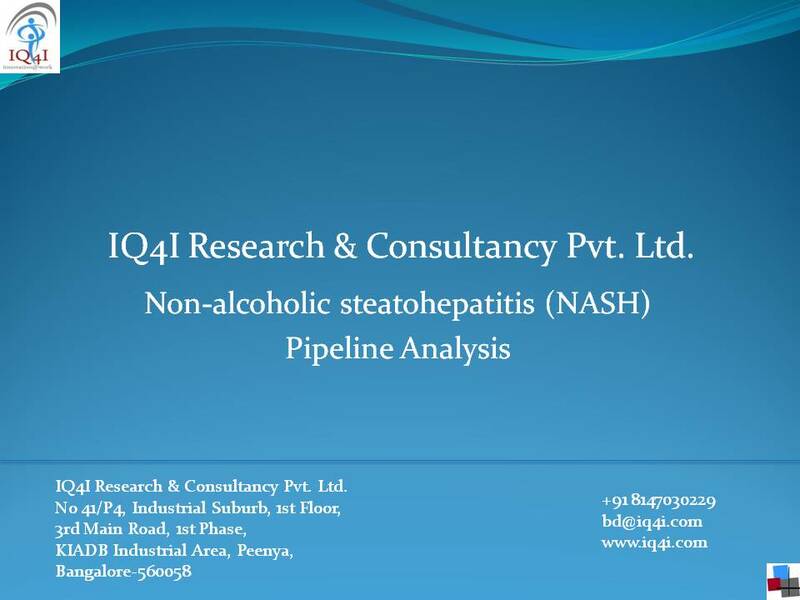 “Non-alcoholic steatohepataitis (NASH) Pipeline Analysis” gives comprehensive insights on the various drugs being developed for the treatment of NASH. The report covers all the drugs that are in various phases of development (Discovery, Preclinical & Clinical). The pipeline focuses on novel pharmacologic drugs & regenerative medicines covering small molecules, antibodies, stem cell therapies, recombinant proteins and RNA-based therapeutics, but excludes symptom relief drugs, generic combinations and supplemental drugs. The report has 206 pipeline molecules and also covers some of the hot targets in research for NASH treatments and NASH related biomarkers. This report enables Pharmaceutical/Biotech companies, Academic institutes, Individual researchers, Investors, Medical technology companies, Service providers and other associated stake holders to identify and analyze the available licensing/collaborative commercial opportunities in the Non-alcoholic steatohepataitis (NASH) drugs market. The report also provides strategic insights on some of the molecules that are yet to be launched in the next few years. In this section, epidemiology of NASH is reviewed to understand potential significance and impact of the disease. Global & US prevalence rates. In this section, various NASH associated targets, mechanism and upcoming therapies are discussed. The report covers novel targets in early research for NASH along with disease progression biomarkers associated with NASH (Inflammatory, apoptosis, fibrosis). In market analysis section, global NASH drugs market is indicated along with the estimated Peak sales ($) of leading clinical stage drugs forecasted from 2020-2026. Forecasting model for NASH market. NASH Market and estimated Peak sales of 11 clinical candidates (GR-MD-02 - Gilead, GFT505 - Genfit, OCA - Intercpt, IVA 337 - Inventiva Pharma, Aramchol - Galmed, Selonsertib - Gilead, Cenicriviroc - Allergan, IMM-124E - Immuron, MGL 3196 - Madrigal, GS-0976 - Gilead, Emricasan – Conatus). NASH related deals analysis with financials (upfront, milestones and royalties). Funding scenario in NASH market. Pipeline analysis was carried to get deeper insights on various treatment modalities in discovery, preclinical & development section, pipelines from major companies were identified and Potential targets were reported along with Mechanism of action, Current development status & nature of molecule. Pipeline analysis by developmental stage (Discovery to Clinical development). A global key players deals (Collaborations, Licensing, Service agreements, grants, funds).